This post has been a long time coming. 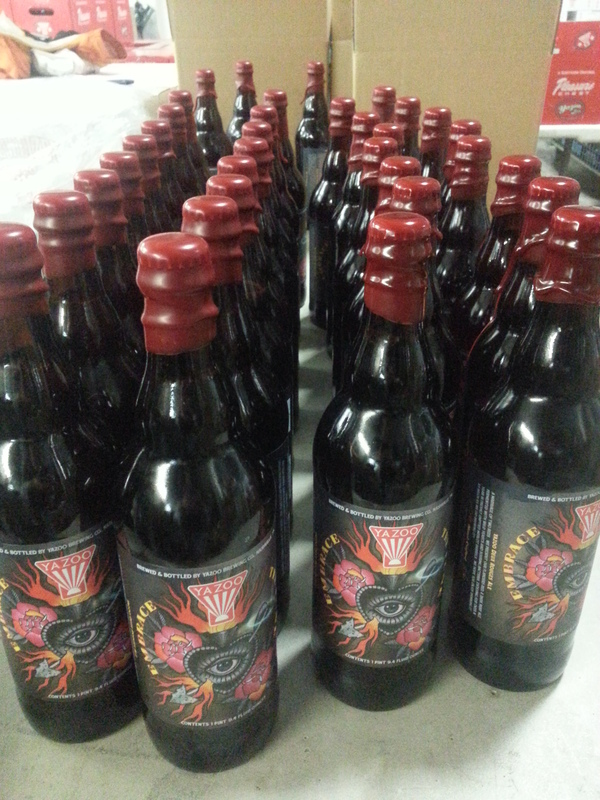 Honestly when I started this blog I never dreamed I would be writing about an Embrace The Funk bottle release, but holy cow it is happening. After over a year of aging in freshly emptied Merlot barrels the Flanders Red that Linus and I brewed is ready for commercial release on January 26th. Just in time for the Superbowl the following weekend! 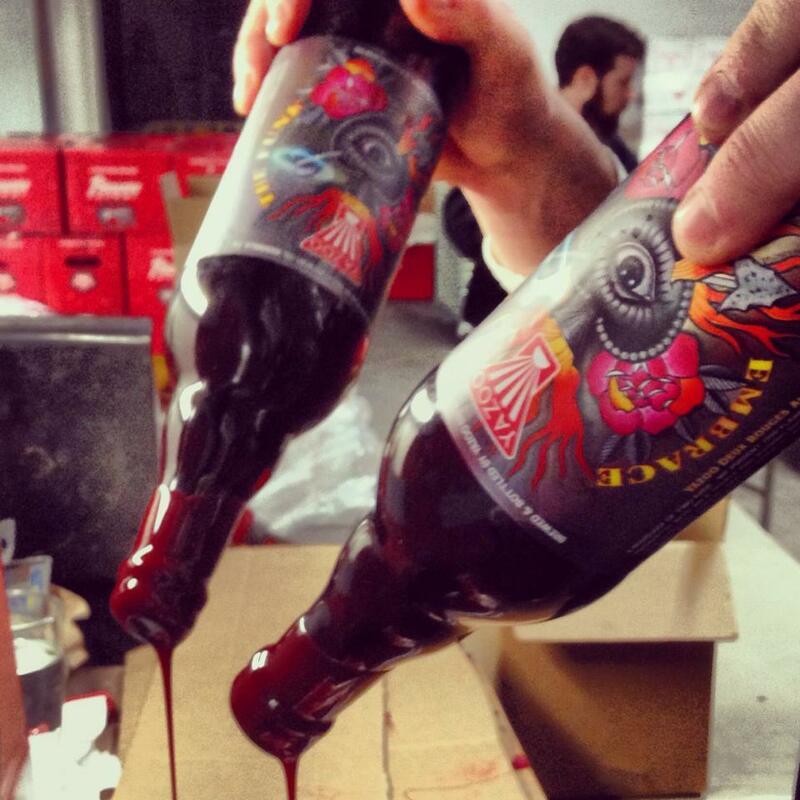 I wax dipped every bottle this morning and think the deep red/burgundy color looks killer. Speaking of looks you are probably wondering about the label. The artwork is an original from Ryan Thomas at the famed Black 13 Tattoo shop. Many Tattoo fans will know one of the shop owners: Josh Woods. We were thrilled to work with Ryan and see the label come to life, it’s one of those “pictures don’t do it justice” deals…in my opinion =) . A MARRIAGE OF TWO REDS – WE PRESENT OUR FLANDERS RED, A DARK RUBY ALE FERMENTED WITH WILD YEASTS AND SOURING BACTERIA, EVOLVING FOR OVER A YEAR IN FRESHLY EMPTIED MERLOT BARRELS. WE HOPE YOU ENJOY DRINKING IT AS MUCH AS WE DID BREWING IT! 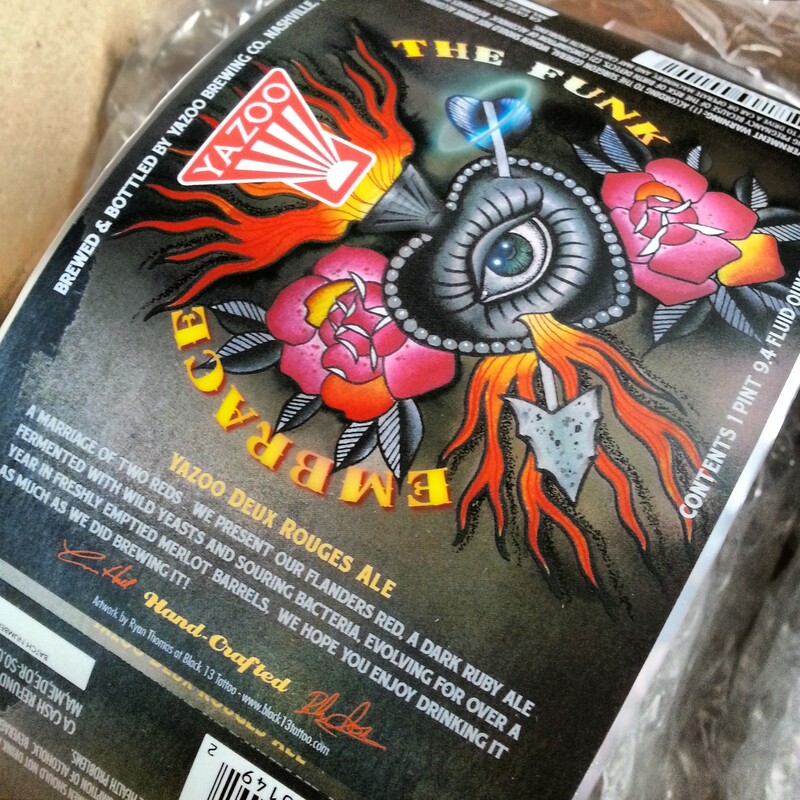 Here is what you need to know: At 2pm Sunday 1/26/14 the taproom doors will open. Those 21 and older will get a ticket. There will be a drawing around 3pm. If your ticket matches the ones drawn you will get a limited edition (150 made) release day poster which is individually numbered. This poster gives the winner the opportunity to buy a maximum 4 bottles at the taproom. There are 600 bottles in this release. The whole event will take place in the taproom area. Bottles are an even $25 each. Bottles will not see distribution to any other retailers, so the only place to buy will be the taproom located at 910 Division Street in Nashville. Linus and I are really pumped about this release. Deux Rouges had a great reception at the 12th South Winter Warmer in December. Since we now have a dedicated 4 head sour/wild beer bottling system, we plan to release a few more funky bottled beers this year. Hope to see you on Sunday and while I wish I could hold bottles for people, I just can’t…but there are some great traders in the Nashville area that would probably help anyone in need out. PS- If the fruit has dropped out I hope to have a new beer on tap that day too. Congrats, man! Bottles look great! Those bottles look awesome! I’m sad we don’t get Yazoo here in Dallas, not that this one would get to us anyway.